Cattle are considered to have been one of the first animals domesticated by man for agricultural purposes. They were tamed to provide milk, meat and hides and for draft purposes. The exact time and place this happened is hidden in the mists of antiquity, but it is thought they were probably first domesticated in Europe and Asia about 8500 years ago. Domesticated cattle are in the family Bovidae which includes ruminates with paired, hollow, unbranched horns that do not shed and an even number of toes. They belong to the genus Bos and the subgenera Taurine which includes the two species tarus and indicus. Cattle are ruminants (as are sheep, goats, deer, and giraffes), which gives them a unique digestive system that allows the digestion of otherwise unuseable foods by regurgitating and rechewing them as cud. They thrive on grasses and other low quality plants built predominantly of cellulose. Cattle have one stomach that has four compartments. They are named the rumen, reticulum, omasum, and abomasum. The rumen is the largest compartment and is like a fermentation tank, providing the anaerobic environment, constant temperature and pH, and constant mixing that allows microbes to break down the cellulolse. The reticulum, known as the "Honeycomb", is is the smallest compartment. The omasum's main function is to absorb water and nutrients and is known as the "Many Plies." The abomasum is most like the human stomach; this is why it is known as the "True Stomach." All breeds of British and European cattle like Angus, Hereford, Charolais and Simmental belong to the tarus species. The humped cattle of the tropical countries like Brahman and Africander belong to the indicus species. Many contemporary breeds are the result of crossing two or more of the older breeds. Most of the new breeds originating in the United States were developed in the Southern states where the standard breeds lacked resistance to heat and insects and did not thrive on the native grasses. Other Bovidae that are so closely related to true cattle that they can interbreed include the bison, buffalo, and yak. 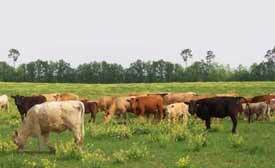 Purebred cattle breeds have been selectively bred over a long period of time to possess a distinctive identity in color, size, conformation, and function and have the prepotency to pass these traits to their progeny. The world cattle population is estimated to be about 1.3 billion head, with about 30 percent in Asia, 20 percent in South America, 15 percent in Africa, 14 percent in North and Central America, and 10 percent in Europe. The 10 states in the US with the largest cattle populations are Texas, Missouri, Oklahoma, Nebraska, South Dakota, Montana, Kansas, Iowa, Kentucky, and Florida. Click on the breed you would like to know more about in the Index on the left. These are some of the current topics being discussed on CattleToday.com's Breeds Board. Why don't you join in? Cattle Today Online is the cattleman's guide to the cattle business. Take your time and look around. You'll find the net's best cattle news, free livestock classified ads, free ranch listing, the latest USDA livestock market report, free ranch email, Baxter Black, and a free newsletter just for ranchers. While you are there browse our Links and find a list of breeders. Or make someone smile by sending them a Cow Card! These are a few of the topics being discussed on the Q&A Boards. Just click on the topic to read it. Why not join the discussion? Copyright © 1998-2017 CATTLE TODAY, INC.